The Aldwych Speed Club is an affiliated long-track club. Long Track speed skating is run on a 400 metre ice track. at De Uithof in the Hague, from novice to expert. Many members of the Aldwych speed skating club (who train doing Short Track at the Guildford Spectrum) went to The Hague in Holland for the 2019 British Long Track Championships. With no 400m rink in the UK they have to go to Holland to train and compete. Much as last year we went with a strong team, including some new members amongst the old hands, with a good mix of skaters across all age categories and both sprinters and long distance skaters. On the first day they raced in the usual time trial format, over the sprint distances of 500m, 1km and 1,500m. Those that prefer distances could race in either the 3km or 5km later on. The club picked up wins and podiums in a number of distances. On the second day we had a "supersprint" competition (average times over two 100m and two 300m races), followed by a "mass start" points race (up to 16 laps) and finishing with the a team pursuit race. The event is very inclusive for a national championships with a number of international friends and Dutch locals racing with the British skaters, having a great time but unable to win medals. Once again the club took the best team award. Peter Riches breaks his own 3000 metres British record at the Viking Race 2019 in Heerenveen. Also competing for GB was Alexandra Snowdon who gained a PB twice in the 500 metres. Peter Riches sets another British record. This time in the 3000 metres at the Country Match between Norway, Sweden, Finland and Great Britain at the Viking Ship stadium in Hamar, Norway. Also competing for GB were Alexandra Snowdon and Theo Collins who both gained PBs in 500, 1000 and 1500 metres. The Viking Ship or Vikingskipet, is a unique ice stadium shaped like an upturned ship set in a lakeside location which has hosted Olympic speed skating. A great weekend for UK longtrack, with six personal records beaten and fifteen season bests set. 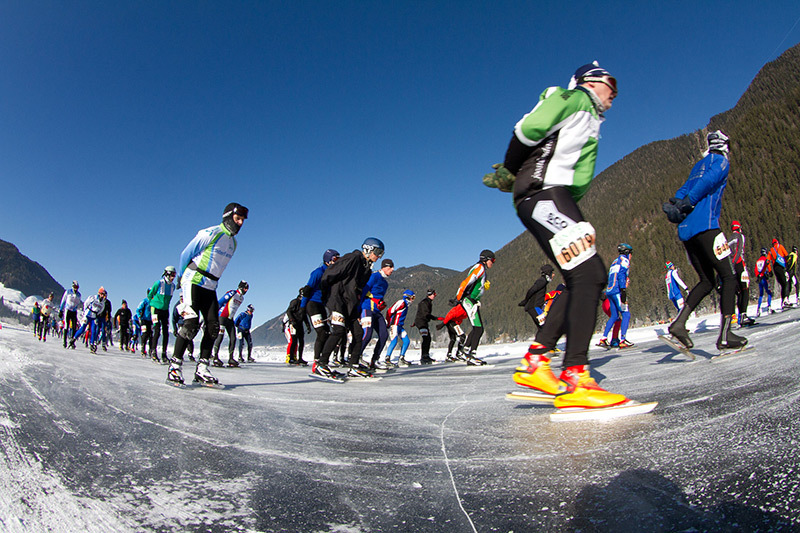 The world's biggest ice sports event with 3000 active participants in speed skating marathons over 50, 100 and 200 km at lake Weissensee in Carinthia. Mainly the Dutch are attracted by this fascinating sport and have been coming to lake Weissensee every year at the end of January since 1989. At the ice skating marathons that are open for everyone an unmanageable number of speed skaters cope with the 200 km. Their target is to get 200 km done on speed skating boots once a year. Paul Connaghton of Aldwych Speed Club will be there again this year 2019 to complete this gruelling course again hoping to achieve a time of under 10 hours. To do that he sets out before dawn and finishes as the sun sets. Best of luck Paul. November 17th and 18th was the second UKlongtrack weekend of the season. It was well supported by about 20 skaters aged from under 10 to over 70 years old. Three on ice sessions were preceeded by warm ups and dry land training. Races were held on Saturday (seniors and up) and Sunday (juniors). 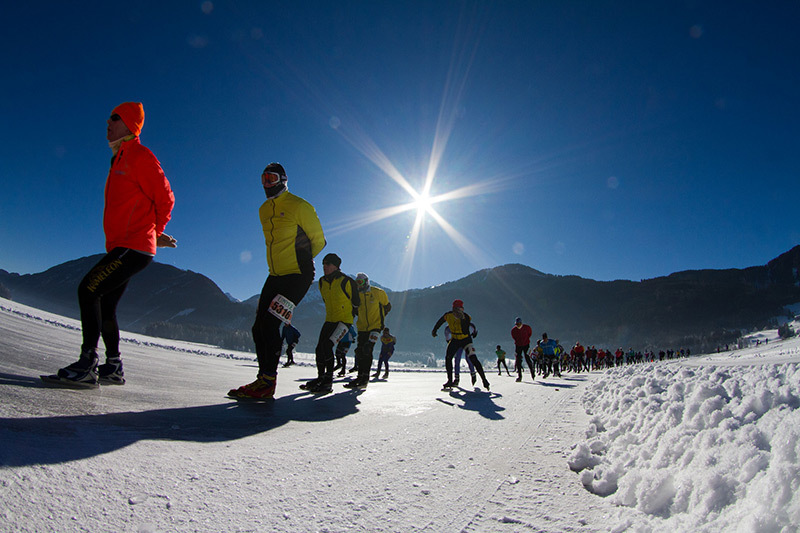 The Alternative Elfstedentocht (11-Cities-Tour) at Weissensee takes place from Mon. 21st of January to Fri. 1st of February 2019. Paul Connaghton of Aldwych Speed Club will be there again for the 2019 edition after successfully completing the 200km course in January 2018. 1st Training Weekend of the 2018-19 season and UK Longtrack Talent Spotting Weekend. Opening weekend at De Uithof, NL. Several 400m tracks in Netherlands open during September; Elfstedenhal at Leeuwarden on 17th and Thielf at Heerenveen on 11th. Most others open first or second week in October.